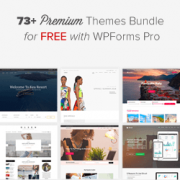 We have partnered with CSSIgniter and WPForms (our sister product) to create a limited-time unique bundle offer for WPBeginner users where you can get 73 premium WordPress themes and premium plugins for free. Note: This is a crazy good deal, so we are only going to keep it live for the next 7 days or until we run out of voucher codes (whichever happens first). If you’re interested, then you need to read thoroughly and take action fast! You probably already know by now that WPForms is the best WordPress form plugin in the market. It comes with powerful features like drag & drop form builder, surveys, polls, smart conditional logic, email marketing forms to grow our list, payment forms to grow your business, guest post submission, form abandonment, and so much more. Simply put, WPForms makes building online forms easy. This is why over 1 million websites trust WPForms to create their forms. If you’re not using WPForms Pro, then you’re missing out on easy opportunities to grow your business. 6 Premium Plugins from CSSIgniter (including MaxSlider, EventIgniter, and AudioIgniter). Now each of these premium WordPress theme individually costs $49 which makes the total value of the package over $3,577. But you can get it for free with a purchase of any WPForms premium plan. WPForms premium plan range from $49 (basic features) to $199 (all Pro features). If that wasn’t a good enough deal already, you can use the WPForms coupon code: SAVE20 to get an additional 20% OFF. You’re probably thinking this deal is too good to be true – what’s the catch? There’s no catch! The only caveat is that we can’t offer this deal forever, and we only have limited vouchers for the bonus offer. So you need to ACT FAST! 1. Buy any WPForms premium license. 2. Send WPBeginner a copy of your purchase receipt. After you complete your purchase, simply send an email to WPBeginner support with a copy of your purchase receipt. We will send you the voucher code to redeem the special bonus worth over $3,577! What are you waiting for? Go ahead and take advantage of this offer before it runs out because it will! We hope that you enjoy this super exclusive deal, and we look forward to bringing you more amazing offers like this in the future! Please I want to know if I buy WPForms today whether I am still eligible for this deal? I bought a WPForms premium license on Oct 6 and I have leave a reply. But I didn’t receive any email from WPBeginner. I don’t know whether you receive my email or not. I purchased WP Forms and sent purchase receipt. I did not receive rewards, however. Please check! We have received your payment for WPForms – thank you for your business! For your records, you can find a copy of your payment details below. If you would like an invoice for your payment, you can generate and download a custom invoice from your WPForms account. Please check your email account for a reply from our team. You can also use the contact form to reach out if you haven’t received a reply from our support team. I have completed a purchase of WPForms premium license. How can I sned you the copy of my purchase receipt? Please send us an email using contact form. Will I be getting the developer plan from cssigniter.com for one year along with any package from wp-forms? Yes, you will get the CSSIgniter’s developer club license with purchase of any WPForms license. I bought a WPForms premium license and sent a email to WPBeginner. Do you receive my email? Hi. I love WP Forms! If I purchase a new license today, do I get lifetime access to the 73 premium themes (+plugins +templates) or will it work for one year only? You will get access to developer club license for 1 year. You can continue using the themes or plugins you have installed even after the license has expired. What should I do? Should I have an account in WP beginner to avail offer?and plugin and these are particularly to single site or can I use it on multiple sites? Please read the details in the article above. Besides what’s listed, what are the benefits of the premium plan over the basic??? If I buy the basic plan are only the basic features activated on the 73 free themes??? 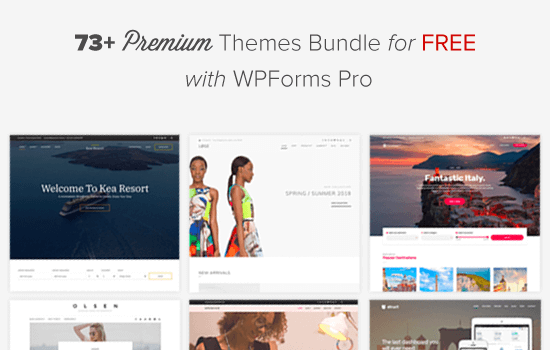 You’re getting the themes for free if you purchase WPForms premium plan. The Basic plan of WPForms give you all the essential features, and the Pro plan comes with powerful features like payment integrations, surveys feature, etc. At the moment I am not using any website pay exact only depend on facebook ads website. The last time I did use the WordPress was from my hosting GODADDY several months ago, but it suddenly stop due to not pay for SSL. I was not happy with GODADDY that I was not informed before I use their wordpress. After paid for the SSL the wordpress that I had used cannot be restore to use it again. I have yet to understand how to use WP first and how well it work before I can purchase any offer for/regarding with WP? It will be no use to me to purchase your offer when I am not using any WP products yet. I am thinking of changing the host. I heard that BlueHost is the main host for WP? Any suggestion and advise. please. Yes Bluehost is an officially recommended WordPress hosting provider. They offer free domain + free SSL, and they’re offering our users over 60% off. You can follow our step by step guide on how to start a website. My site receives 50k unique visits per day. Is there any bluehost plan that can handle it? It all depends on your caching. You would need to be on a higher end VPS or dedicated server at that point. Are both the themes and forms plugin available for just 1yr in this offer? Do you have to renew to keep using? Hi Piyush, yes both plans are annual. You can continue using the plugin and themes after 1 year, but you will not be able to get any updates or support after that if you don’t renew your subscription. I bought the WP Form and didn’t get the voucher for the 73 cssigniter themes. if we get this offer, can we use this premium themes on multiple websites? Is it limited to single site or we can use on N number of sites? I would like to know if I can use Mamp until I am ready to purchase a domain name and web hosting acct? I hear so much about Gutenberg when the editor roles out are the themes compatible? Yes, you can use MAMP to test and build your website until you’re ready to push it live. I updated my premium license recently – $199, ( 4th September) can I avail of the free 73 themes offer? Unfortunately this is only for new users, but don’t worry we have some really awesome goodies coming for existing WPForms Pro customers as well. We’ll email that separately via WPForms customer newsletter (next month). Can you clarify the pricing? Is the price a onetime price? Is there a way to recover the package should my computer have to be restored at some point in the future? Is there someplace to see the 73 free themes?